If you’re a freelancer and want to brush up on your skill set, then you may be wondering exactly how to gain the skills you need to become more valuable in the marketplace. The good news is that you no longer have to go to a college and sit in a classroom to get the training you need – although it is an option if that’s what you want to do. However, there are now a ton of virtual training options for freelancers across a range of disciplines. But this is a situation of buyer beware. Some of the training is better than others. Some of it’s downright scammy, and some can help you to gain the skills you need to land higher paying clients. Let’s get into the details of how virtual training works and how to get the training you need at the best possible price. Virtual training is a broad term that refers to training that takes place online rather than in the classroom. This type of training can come in many forms - from traditional college classes to training for specific programs like Excel, Photoshop, and Adwords. You can learn nearly anything from virtual training that doesn’t require hands on, group experience (think drawing blood for a phlebotomy license). But you have to be careful about where you get virtual training, because there are plenty of scam artists on line who are happy to take your money, but don’t give you much value back for what you spend. Where Can Freelancers Get Online Training? There are several sources for quality online training in a multitude of fields. Let’s look at several options. This is an updated version of a traditional route. You can take online college classes in nearly any subject matter that you can imagine. This is often one of the more expensive options for virtual training – although usually considerably less expensive than taking classes in a classroom. If you go this route, be sure that the college you are taking classes from is accredited. Accreditation is the best way to make sure that the classes you’re taking come from a legitimate learning institution. 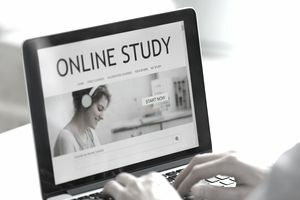 Online college classes are the best for people who are working toward a degree and for whom a degree will help increase their earnings. If you don’t need a degree and just need college level skills you can get online training through MIT open courseware. These are MIT level courses that are offered without credit for free. There are many major brands that now offer specific skill training with certifications that can be used to show your level of expertise in a particular subject matter. Microsoft, Google, and Adobe all have specific training and certifications for their product lines, and there are many other certifications you can get – especially from branded software suites. Sometimes the certifications require months or years of real world experiences and sometimes they are given after a virtual training course. Prices for these types of certifications tend to be less expensive than a college degree and more expensive than the micro courses we’ll go over below. The big benefit is that if you are certified by the brand you have “proof” that you know how to do what you claim you can do. One of the most appealing ways to get virtual training in the digital age is in bite sized chunks. This is where online micro courses come in. These are usually inexpensive and cover one small subject area at a time. They don’t typically offer official certifications but are a great way to brush up on skills ranging from software development to photography and marketing. Usually this type of training is offered in small screencast videos, PDFs, and other interactive types of online content. One of the top (and first) platforms to offer this type of training is Lynda.com, which has now partnered with LinkedIn learning. They offer unlimited learning from $24.99 a month. Another platform that is popular for this type of online training is Udemy. Udemy offers individual courses starting at $10.99 and has star ratings so you can tell what the community likes and what it doesn’t – which is a great benefit in knowing where to spend your time. If you’re looking for virtual training to move your freelancing career ahead you should carefully consider what the market is looking for and get the training based on what you see as a gap in the marketplace. And while many people will need more expensive professional certifications, many others will be able to get the skills they need through a micro course site like Lynda.com or Udemy.